I’ve been searching for my current favorite toothpaste since I came to Nebraska. I ran out before my trip here, so I’ve been using a less favorite berry-flavored variety. I’m not fond of the berry, so I’ve been looking for my Tom’s of Maine Sweet Mint Gel, but since I can’t find it, I’ve wondered if there was some sort of substitute I could use. Avoiding sodium saccharine is hard. Nearly every toothpaste contains it. 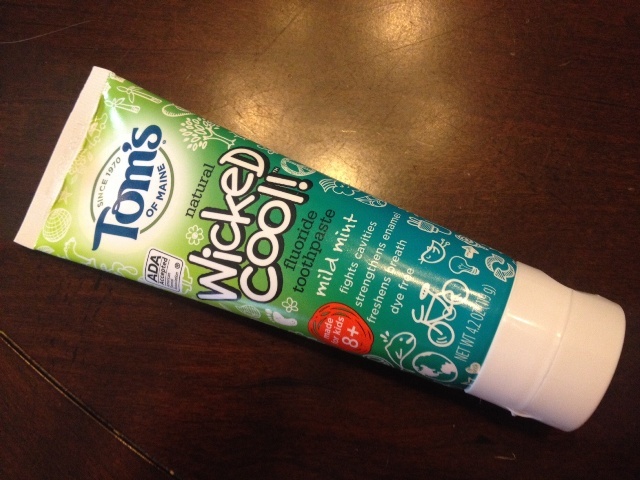 But I did find another Tom’s of Maine product I haven’t tried yet: a kid’s version of their mint toothpaste. I got some. Dang it. I messed up a lot of code in that comment. Would you please fix it?